Grade Hound helps you manage your classes, organize your assignments, and track your grades. With Grade Hound, you’ll always feel ahead. Why should you use Grade Hound? 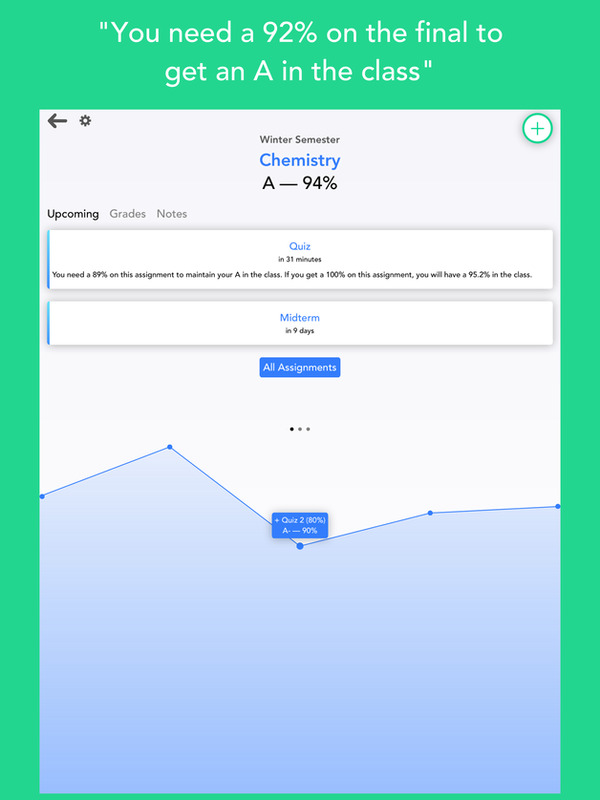 • Grade Hound tracks your grades with precision. When viewing an upcoming assignment, you’ll be told exactly what grade you need to either achieve the next letter grade in the class, or maintain your current one. For example, if you have an 88% in a class, Grade Hound might say something like, “You need a 93% on this assignment to achieve an A in the class”. Both point and percent based grading systems are fully supported. You’ll also be presented with a slider that you can drag to test what your class grade would be if you get a certain score on the assignment. • When viewing a grade, you’ll see exactly how much it counts towards your final grade in the class. You’ll also be presented with a slider that you can drag to test what your class grade would be if you had gotten a certain score on the assignment. • Grade Hound is highly customizable. It fully supports both point and percent based grading, custom letter grade cutoffs, custom units for each class, weekly and block based scheduling, custom GPA schemes, and per class customizable assignment types. • See a detailed graph of your grade timeline on a per-class basis. This lets you see how your course grade changed as new grades were added. • Track completed assignments, organized by the date you completed them. • Add semesters/quarters/trimesters and track your GPA. You can specify custom GPA scales on a per-class basis. You can also specify how many units each class is. • Add classes, notes, and grades. You can specify custom grading scales and custom assignment types on a per-class basis. Grade Hound fully supports both point and percent based grading systems. • Add assignments, multiple reminders, and repeat schedules. Grade Hound fully supports both weekly and block based scheduling. • Add notes, and attach multiple photos to your notes. You can also attach notes to assignments. 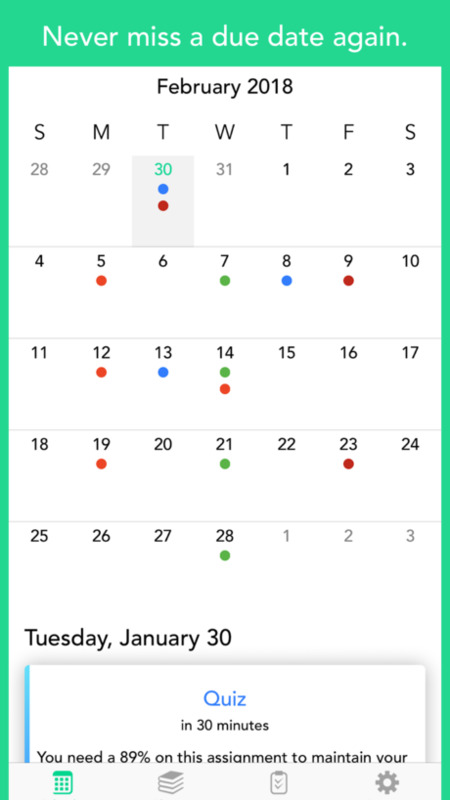 • Grade Hound presents you with a full screen weekly and daily calendar for viewing upcoming events and assignments. • Grade Hound has a Today View widget that displays the week's events. You can mark events complete right from notification center, or tap one to launch Grade Hound right into an event. • Get morning and/or evening digest notifications. A morning digest notification is a summary about the day’s upcoming events. An evening digest notification summarizes the next day’s events. Digest notifications are configurable by days of the week and time. 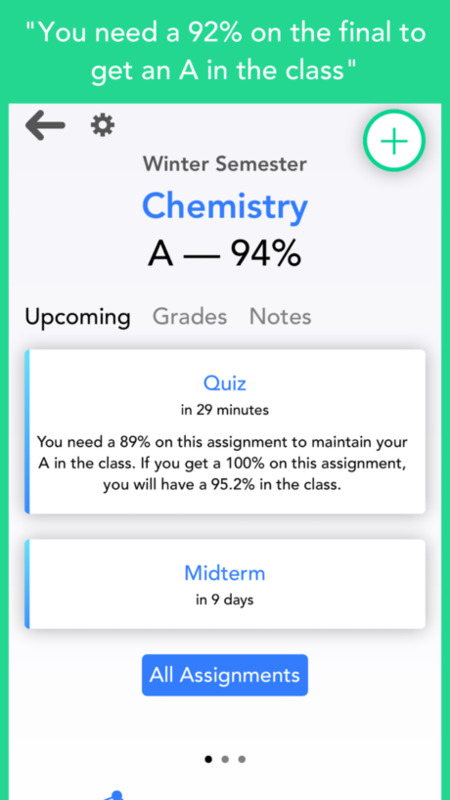 • Grade Hound supports 3D Touch to quickly complete assignments. You can add up to 2 classes with the free version of Grade Hound. If you'd like to add more, we ask for a one time in-app purchase.